This is one of my very favorite dishes EVER. This is so easy (3 ingredients) and the flavors are PERFECT together. Take a small boneless chicken breast (or cut a large one in half) and cut a slit thru the largest area. 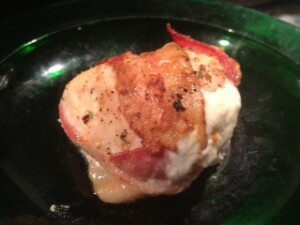 Stuff with cream cheese, season and wrap it with bacon strips. Bake at 350 for about 20 minutes then broil until browned. These can even be put together in advance and kept in the fridge or freezer. Simply thaw and bake. Everyone loves this! This entry was posted in Chicken, Pork by Modern Mom Meals. Bookmark the permalink.